An electric fence can be the perfect solution to keeping chickens safe from predators such as foxes or badgers. An energiser is used to generate a high voltage somewhere around once per second. This is somewhere in the region of 5000 to 7000 volts which is sufficient to give predators (or your chickens) a shock when they touch the live wire (usually a galvanised strand of wire, tape or rope with small electric wires woven into it) and make contact with the ground at the same time. The electrical circuit is completed and they experience a muscle contraction which is unpleasant but does not harm them if they only receive a short shock like this. Why do we need such a high voltage when electric fencing chickens? Well fur and feathers are good insulators so we need the higher voltage in order to jump across the gap, to make sure the animal receives the shock. Both chickens and predators learn fairly quickly that it is unpleasant and will avoid the fence in future. Caution: Take sensible precautions to make sure animals like hedgehogs cannot get trapped in the electric fencing. 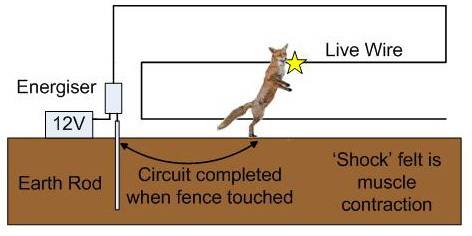 The circuit is completed through the fox to ground when the live wire is touched. The fox learns not to touch the fence again. If you have an existing fence that won’t keep foxes out, a 3 wire electric fence could be the answer to keep your chickens safe. You will need screw in insulators to hold the wire, tape or rope. Tape and poly rope is good if there are horses on the other side of the fence because they can then see the electrified conductor more easily. If the fence wire is on the same side of the posts as the electrified wire, use stand off insulators to prevent the two touching in the wind or when the fence sags. What height should you put the wires? Well one about 6 inches off the ground, high enough to avoid getting shorted out by the grass but low enough to stop digging, another around knee height which is nose height of a fox and the last one at the top of the fence to deter climbing. How does it work? Mr. Fox will investigate a fence, looking for the easiest way through. He will usually touch the nose high wire or the ground wire but if he did find something to stand on or try to climb over, the top wire stops him. Because of this, even an electrified fence that is only waist high will keep him out. Most electric poultry netting is only this high. 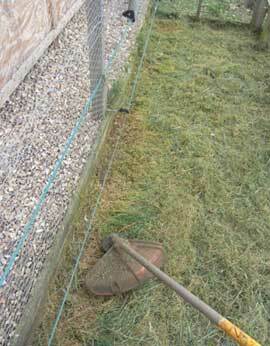 You will need to strim underneath the bottom wire regularly to prevent grass or other vegetation from short circuiting the bottom wire of the fence. The photo to the right shows an electric fence using green electrified tapes that are more visible to horses and people. A simple solution if you have a large lawn, field or other area. Electric poultry netting is good for temporary fencing too if you wish to move your hens around onto fresh pasture from time to time. Poultry netting can be expensive however you won’t need insulators or any other type of fence. Out of the box, you can fence an area, add an energiser and away you go. When choosing an energiser, remember electric poultry netting has multiple strands of electrified wire running through, (usually 12) so a square run with 25m sides or 25 x 4 = 100m perimeter fence becomes 100m x 12 strands = 1200m or 1.2KM. It soon adds up! Check the maximum distance that is recommended for the energiser and ensure there is a little in hand. This suppliers page offers 25m and 50m electric poultry netting kits – you can also see the difference in price between mains and battery operated kits. If you take into consideration the cost of a leisure battery, a charger and the worry of it going flat (and yes, the fox can tell when a fence isn’t working) the extra cost of a mains energiser may look more attractive but you also need to weigh up the cost of having a safe electric socket outside. Just like the 3 wire electric fencing, the wires running close to the bottom of the netting must not be shorted to ground by the grass. This is usually done in one of four different ways. Slide it up the posts and strim underneath. Use a weed killer to kill the grass under the fence. Don’t worry, the very bottom of the netting doesn’t have an electric wire running through it, the wires usually start a ‘rung’ or two up. There are a number of kits available online from specialist suppliers such as this one that contain everything you need. The supplier has chosen the right size energiser, earth stake and provides other bits and bobs such as insulated high voltage cable that carries the energy from the energiser to the fence. If the fence is likely to be in an area where people might touch it, don’t forget to add some warning signs to alert passers by of the danger of touching the wire. They can get quite a shock and become quite alarmed if they touch the fence accidentally and you don’t want to upset people. This is especially important if your fence borders onto a public footpath or even your own garden. Remember visitors will be looking at the birds inside the run and won’t realise the wires are electrified. There are some products on the market that flash a bright LED periodically when the fence is working. We invested in one of these for piece of mind and now a glance at the fence in the dark tells me that everything is in order. This is especially useful at dusk when I’m locking up the birds and checking everyone is safe and where they are supposed to be. Electric fencing chickens is a very effective way to keep chickens in a given area and protect them from predators. Electric fencing does require maintenance, especially during the summer months when the grass is growing but once installed, an electric fence should give you years of protection. I have about 30 chickens atm ..and 2 foxes living in my garden .. the foxes a quite tame and are feed daily ..I never have any trouble because I have a six foot fence with electric wire round and when the chickens are out on the grass they are protected by the movable netting .. Look after your chickens and you will never have a problem. We lost a couple of chickens to a fox recently after three other families in our village lost all of theirs. 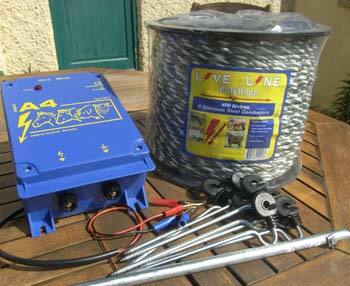 I’ve got hold of a second hand electric fence system (P500 Falcon) but my wife is very anxious that it will be wrong to use in case the chickens are hurt. We’ve had chickens for years but are new to using electric fences – any advice; should we, shouldn’t we? Need objective fact to avoid arguing. Firstly, electric fences deliver a high voltage but very low current. If you want to understand voltage and current then compare it to a ‘hosepipe’ analogy with voltage being the pressure and current being the amount of water coming from the pipe. In this case, it’s a high pressure jet from a thin pipe (like a pressure washer) that hurts if you touch it but it won’t kill you like getting hit by a fast running river. The unpleasant feeling caused by an electric shock is basically a muscle spasm. There is not enough current to kill, although if an animal gets caught up in it, subjected to the regular second shocks would finish it off, probably give it a heart attack, I don’t know but certainly cause an incredible amount of stress. Hedgehogs are my concern here and the only animal I know to be killed by electric fences when a wire is too close to the ground. Sadly, they curl up into a ball rather than move away. So if you do install a fence, please remember to keep the bottom wire at a height above hedgehogs but low enough to stop a fox getting underneath for digging. Chickens on the other hand are well insulated by feathers, so it takes quite a high voltage for them to get a shock. Their instinct is to fly and they can become startled but they will quickly learn after touching a fence, it usually only takes the one touch. 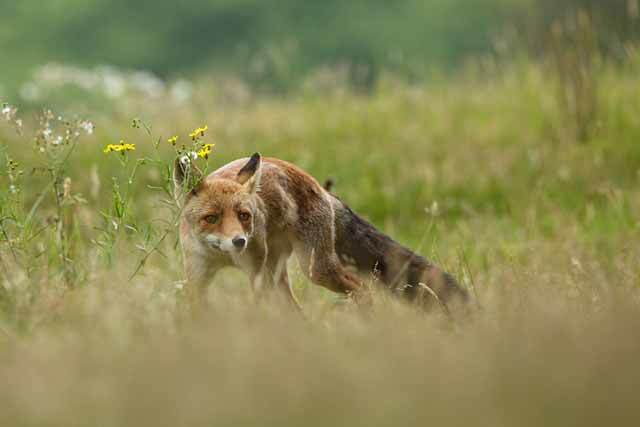 Foxes will often instinctively NOT touch a fence but if they do, they will respect it and avoid it, ignoring your chickens. 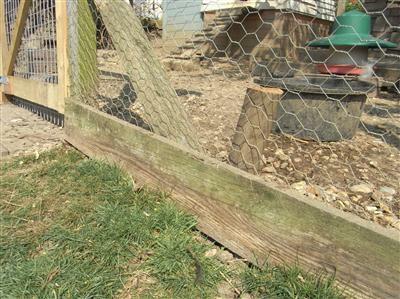 In honesty, a fox will terrorise chickens and to kill them they will normally rip their heads off, so to take the risk of chickens having a one-off shock from a fence is worthwhile in my opinion. I need fencing for a site without electricity/mains, so I’ll need some kind of battery/solar powered system ..any suggestions for a good one? 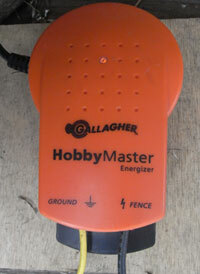 The cheapest way to do this is to buy a 12V energiser, an earth spike and a leisure battery. 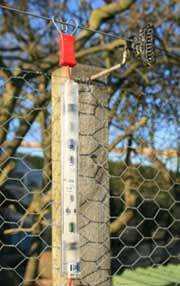 Buy some insulators to screw into the fence posts – long ones are better, then either galvanised electric fence wire or electric rope / tape around the run at 3 different heights: 6-8 inches off the ground to stop digging, at fox nose height and around the top of the fence to stop climbing. If it’s on an allotment, make sure you put up signs to warn people. Charge your battery every couple of weeks at home. You could but it needs to be insulated from the ground. It would need mounting on plastic insulators of some sort and keeping off the floor… probably not practical with a normal chain link fence.